Two GJM workers were taken away by police from the Bagdogra airport near Siliguri in West Bengal after they landed from Delhi on Thursday, on a day party leader Bimal Gurung and his associates were supposed to come back to the state after spending about a year and a half in hiding. Rohan Rai and Yogendra Pradhan were taken away in police vehicles as soon as they landed at the airport. “Rohan Rai and Yogendra Pradhan are our supporters. They were carrying documents that were to be submitted to the Jalpaiguri circuit bench of Calcutta High Court. We are trying to find out what are the steps police are planning against them,” said GJM (Bimal Gurung faction) spokesperson BP Bajgain in Siliguri. Gorkha Janmukti Morcha leader Bimal Gurung and his associates were supposed to land on Thursday after the Supreme Court on Wednesday allowed him, the party’s former general secretary Roshan Giri and others four days to approach the high court to seek anticipatory bail in connection with various criminal cases registered against them. The top court also said that its interim order from December 10, 2018, which said “no coercive” action shall be taken against the GJM leaders will continue “until further orders”. “Gurung was keen to come today. But seeing the situation here, we advised him against it,” Bajgain said. A larger number of people had gathered at the airport earlier in the day to greet the GJM leaders. Some GJM supporters alleged that police had blocked their way on National Highway 31 and prevented them from reaching the airport. However, many managed to reach the spot. “Bimal Gurung fooled the people again,” said Binay Tamang, the leader of the other GJM faction. According to GJM leaders, Gurung and his associates had bought tickets on two flights from Delhi. While one of the flights landed around 12:30pm, the other was scheduled to land at 2pm. However, they did not arrive by either of the flights. The stakes of Gurung and his associates are very high this time. Since they were booked under sections of the Unlawful Activities (Prevention) Act and had to leave the hills in August-September 2017, the GJM, the most influential political party in the Darjeeling hills, split. His former associate Binay Tamang and Anit Thapa are leading one faction and moving close to the ruling Trinamool Congress party in the state. Last month, both GJM and GNLF held a press conference in Delhi and announced that they will support the Bharatiya Janata Party (BJP) candidate. 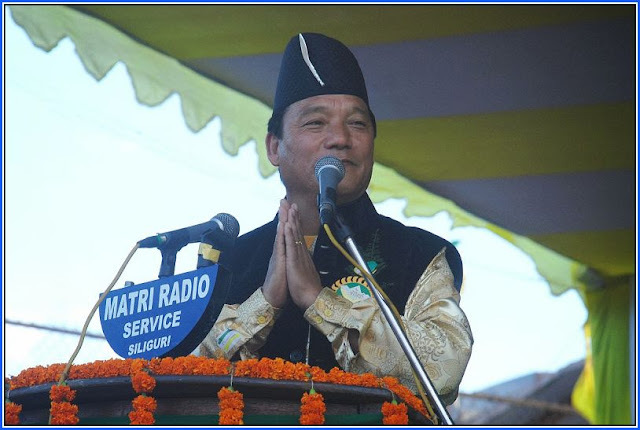 The BJP candidate had won from Darjeeling constituency in 2009 and 2014, thanks to the support of the GJM that was led by Bimal Gurung. West Bengal chief minister Mamata Banerjee installed Tamang at the helm of Gorkhaland Territorial Administration, the semi-autonomous body that runs the affairs of the hills. She also nominated GJM’s sitting Darjeeling MLA Amar Singh Rai, as the TMC candidate from Darjeeling Lok Sabha constituency, highlighting him as the party’s son-of-the-soil representative from the hills and emphasising that there is no division between the people from the hills and those from the plains. The chief minister’s decision has brought together Gurung’s faction of the GJM close to Gorkha National Liberation Front, the second most popular party in the hills, that led the first phase of the armed struggle for a separate state of Gorkhaland between 1986 and 1988, in which about 1,200 lives were lost. Between July and September 2017, the Darjeeling hills suffered a 104-day record general shutdown that was called by Gurung demanding for a separate Gorkhaland. During this period, 13 persons were killed including two policemen. Gurung is facing as many as 121 cases including murder and sections of Unlawful Activities (Prevention) Act and Giri 111 cases. The names of both of them have been struck off from the voters’ list in Darjeeling. Gurung, Giri and several senior GJM leaders were on the run for more than a year and a half.